When you think of making your business a brand, you need to get the maximum number of customers for your venture. One of the best ways to get this is through an email marketing service. An email marketing service is the one that will let you create your own emails and send it to a number of people at once. Thereby, increasing the chances of converting strangers into customers. So, are you also looking for one such email marketing software? The software mentioned in this article are the one that are constructed in such a way that will not only send the emails but also track them through its various features. For example, auto follow up, inbox preview, drag & drop builder and many more. In addition, the bunch of software that has been accumulated here are the ones that will give you quick results and enable you to send emails directly to the inbox of the recipient. All you have to do is to go through this article once & choose the best email marketing software according to your needs! 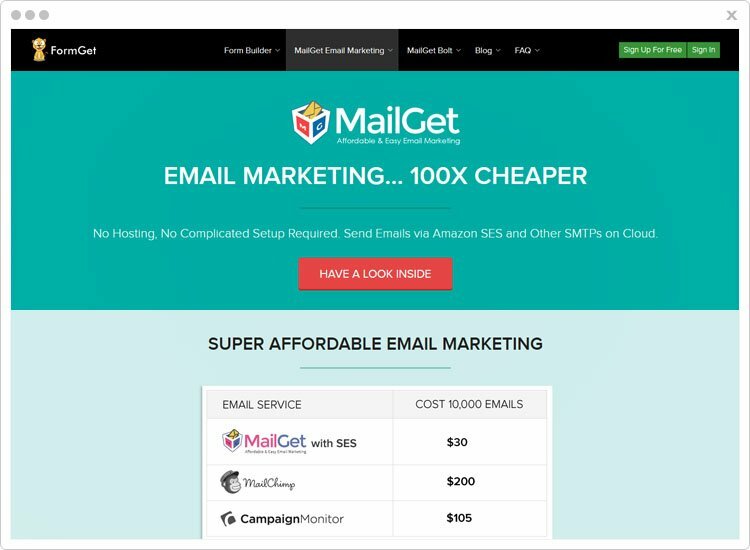 MailGet is a mostly used email marketing service that you will see today in the market. It enables you to create emails quite easily through the drag & drop builder in which you simply have to drag the entities from the field section and drop it to the content section. Starters:- In this plan, the user will be charged in a total of $5 per month in which the user can send unlimited emails to 5000 subscribers. Rookie:- For this package, the buyer will be paying an amount of $29 per month in which you can send unlimited emails to 25,000 subscribers. Pro:- The Pro plan is best for medium-size businesses charging only $49 on monthly basis. After purchasing it, you will get to send emails to 50,000 subscribers without any hindrance. Advance:- It has a flexible package whose subscribers ranges from 100,000 to 1,000,000. Likewise, the pricing also ranges from $79 to $672 on monthly basis. Apart from all of this, it is the only single plan which provides the feature of list cleaning. Through it, you will be able to send emails to only valid & genuine ids. Note:- MailGet also have an annual plan which is the more affordable than other email marketing tools. For more information, just visit its website. The software contains a ‘drips’ section where you can send emails to a number of people on a specified day and time that will be chosen by you. Another amazing feature is the autoresponder function in which the customer gets an auto-generated mail as soon as they fill the subscription form at the site. In addition, you will also get an auto follow up function. It will resend an email if it is not read or opened by the recipient after a selected number of days. In my opinion, the MailGet would the right choice as it is available at such a low price that is $4/m (billed annually) which is way too less in comparison to other service providers. You will get all the features that require to build and send an awesome template. 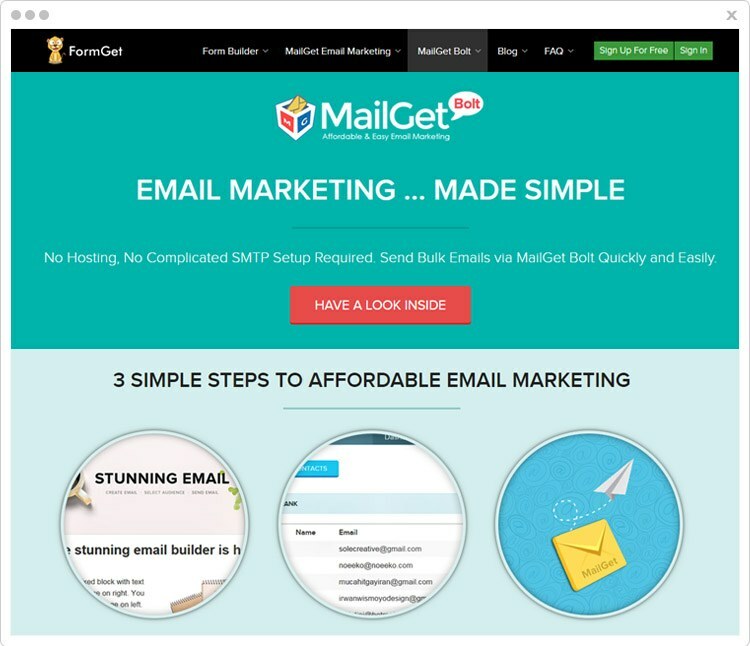 MailGet Bolt is another email marketing tool that gives you the freedom to create your own emails and send it to your probable customers. This system is a boon for the people who are not much into technical stuff as it contains an inbuilt SMTP. It means that you can start sending emails through your own server. Starters:- In this plan, the software is available at $9 per month in which the user can send limitless emails to 2500 subscribers. Rookie:- For it, the user will be charged $19 on the monthly basis for which the user can send unlimited emails to 5,000 subscribers. Pro:- This plan charges $34/month which will be allowing a user to send emails to 10,000 subscribers at a time. Advance:- At last, this plan costs $49 to $439 on monthly basis with subscribers ranging from 15,000 to 200,000 respectively along with 10 monthly campaigns. Note: They have more affordable plans than any of the services mentioned in this article. For example, $7/mo. To know more, visit their website. The software offers 99% delivery rate which means that the mail will fall directly into the mail inbox reducing any chances of your mail to get into spam. Along with drag and drop builder, you will be able to do the segmentation of your subscribers & send emails according to multiple occasions. A feature known as the ’email inbox preview’ is included in the software. Through it, you can make any last minute changes and have a precise look before sending it to the recipient. The software is yet another productive one which also providing great features at a reasonable price that is 10,000 subscribers at $34/month. It is also providing inbuilt SMTP which is an additional advantage. ZohoCampaigns allows you creating multiple emails and delivers it directly to the recipient email inbox. You can import contacts, add them manually or sync from your Zoho CRM account also through the software. Also, it will help you in designing your own email templates through the drag and drop editor. Free plan:- In the free plan, the user will get 12000 on monthly basis for 2000 subscribers. Lowest:- In this package, you will get 1 to 500 subscribers at just $5 with features like unlimited emails, workflows, autoresponders & many more. Highest:- The highest plan will allow you to send emails to 50001 to 100000 subscribers at $350 with features like social campaigns. Lowest:- In this package, the user will get 250 email credits at just $6. Highest:- In this plan, the user will be getting 750 email credits at just $100,000. You can schedule your emails and send it at a specified date and time selected by you. Plus, it also allows automating your follow up emails and send welcome emails through autoresponders. Also, you will be able to expand your horizon of audiences by sharing it on social media like Facebook, Twitter, LinkedIn & many more. The respective email marketing tool enables you to track the emails that you have sent and dynamically gauge their performance. You can also know the opens, bounces or click-through-rates via campaign report. Campaign Monitor is one of the finest email marketing tools through which you can turn people into your customers. You can do all of it just by sending personalized emails. It allows you to create emails, add your subscriber list and then send it to a number of people without any boundations. Basic:- In this plan, the user will have to pay $9 per month for which he will have 2,500 emails across campaigns and automated emails. Unlimited:- In the unlimited plan, the user will have to pay $29 only. Then he will get limitless emails across campaigns and automated emails. Premier:- In the premier plan, the user you have to pay $149/month. After it, you will get unlimited emails, automated email functionality and premier phone. Advance:- Get in touch with the sales team. The software will allow you to include buttons, spacers, video, text and much more within the email that you are creating. You can include the recipient name as well just by selecting ‘insert first name’ in the write a subject line section of the software. Just after sending the emails that you have created through the software, you can simply track these sent emails through a feature known as the ‘worldview’. It will tell you who is opening your email and how they are engaging in. 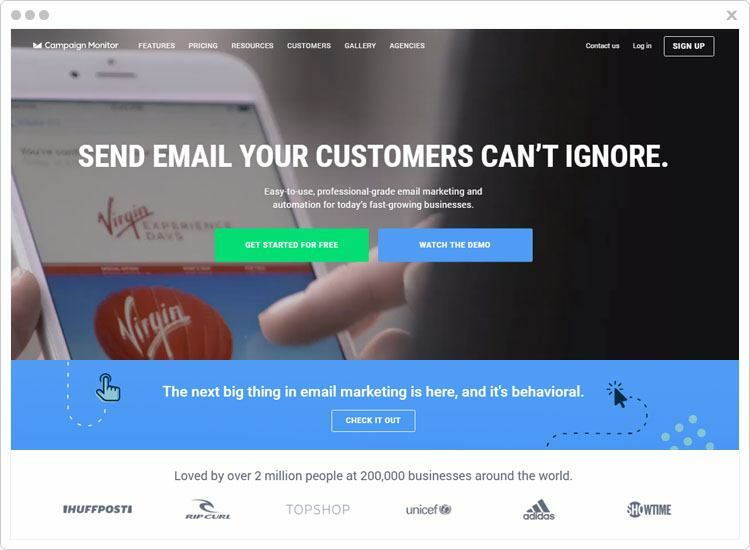 GetResponse is an email marketing service that enables you to create emails in which you can put irresistible/convincing content. You can start at your own from the scratch or you can also choose from the 500+ predefined templates. In addition, you also have 1000 free images to choose from. Email:- This plan is perfect for beginners, which costs $12.30 per month billed annually for a list size of 1000 in which the user will get autoresponders and landing pages. Pro:- In this plan, the user will have the features of email plan, plus, webinar 1000 attendees, costing $40.18/mo billed annually for 5000 list size. Max:- In the Max plan, you will have the features of pro plan, plus, campaign consulting, salesforce integration & more costing $135.30/mo billed annually for a 10,000 list size. Enterprise:- In this package, you can use some features like campaign consulting, dedicated IP and more at just $837/month billed annually for a 10000+ list size. All sort of marketing solution can be put on autopilot. It means you can send auto-generated emails to your customers through autoresponders. You can compartmentalize your customers and then target them independently. It allows creating group contacts based on customs data, geolocation, subscription date and source, subscriber engagement and more. There is a ‘time travel feature’ which tell you the perfect time to deliver a mail when the recipients are more active so that probability of that email to get open will be more. 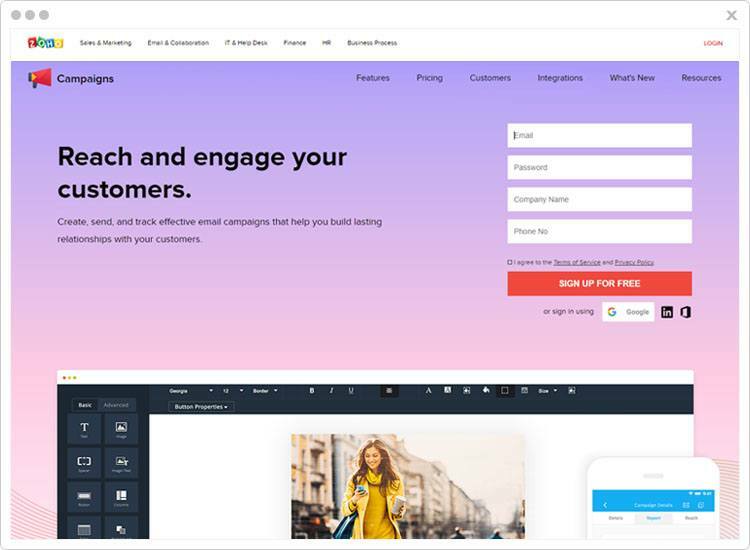 These were the best email marketing tools that give you the freedom to create multiple email templates that will be engaging customers. They will make sure that you get a defined and catchy email format through the number of features incorporated in the software. These software will help you to market your products and services in an attractive in order to attract more leads. They tend to go through the whole email template thoroughly. All you have to do is to choose the best email marketing tool according to your needs & transform the sales of your business in a better way! For any queries & suggestions, just drop a comment below & we’ll reach out to you soon! Useful information. Email Marketing is considered an extremely powerful marketing tool. 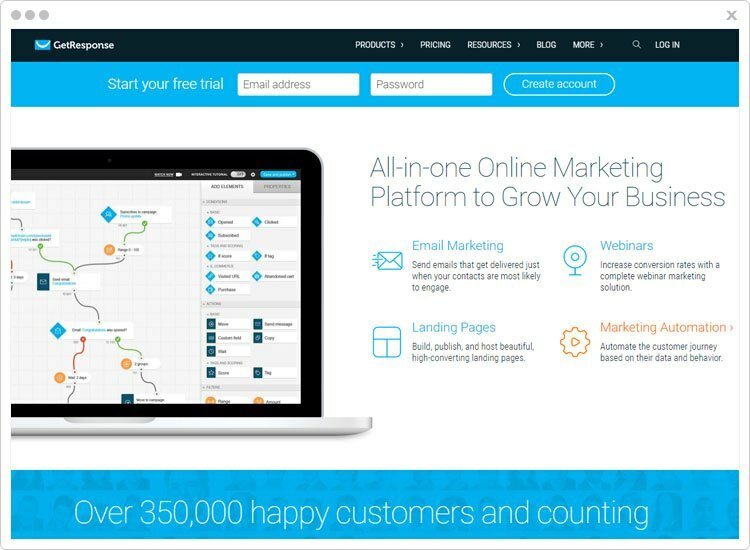 MailGet and ZohoCampaigns both email marketing platform are best for the small business owner or startup.